⬅ Ok Folks… Let’s Get REAL. 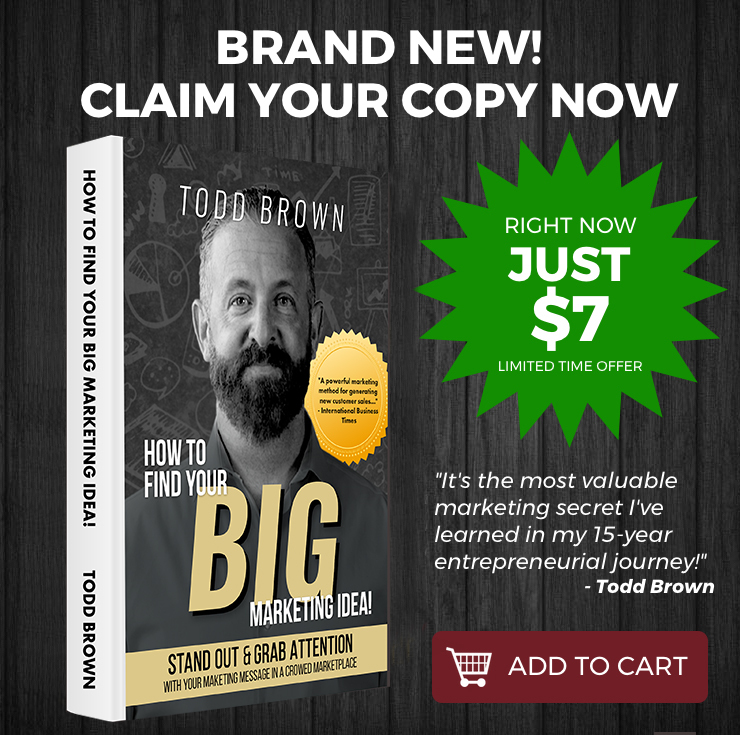 I am constantly teaching the ins-and-outs of why at the foundation of every high converting marketing campaign, you need to have a big marketing idea, an irresistible and superior offer, and an air-tight marketing argument. YES, I am a staunch advocate of focusing on conversions and why conversions are so critical… but today I want to flip things around. Today we’re going to talk about the other side of the equation: traffic generation and media buying. Now, we’re not going to get into the nitty-gritty details, the weeds of traffic generation, because frankly, I don’t think that we need to do that. I don’t think that you need to do that. Instead, what I want to do for you in this post is to give you a high level overview of the way you need to think about traffic generation, the way you need to think about buying media, and it’s VERY different from the way the average entrepreneur, the average marketer goes about it. First of all, when it comes to traffic generation, I really want you to think in two different categories… two different buckets, if you will. One is the method, the other is metrics. Underneath traffic generation we’ve got the method of traffic generation and we’ve got the metrics of traffic generation. You name it, there are probably over 40 different types of traffic methods that you can use. There is no shortage of places to generate traffic out there for you! 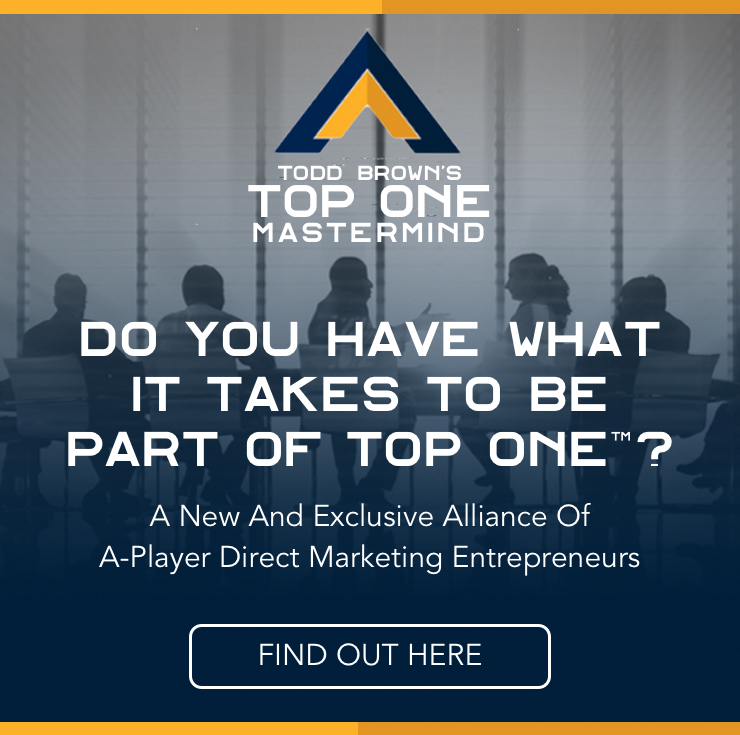 We’re not going to get into the different traffic generation methods because frankly, it’s not the obstacle for 99% of entrepreneurs and marketers. Most entrepreneurs and marketers think that the method will make or break them. 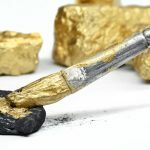 They wrongfully think choosing the right method or being overly concerned about the nitty-gritty details… like how to best use Facebook Power Editor. They get hung up on what type of set-up they should use under the hood in Facebook ads manager account. That thinking is all a waste of your time. Most entrepreneurs think the main issue is the method. They think it should be their main focus, but that is NOT what you need to focus on. So, cut it out already. Instead, where I want you to begin is I want you to begin with the metrics. I don’t care if you only have $5 bucks or less to spend per day. This applies to everyone using media buying to acquire customers online. Because understanding the metric of traffic generation I’m about to show you is the key… Grasping what this one specific metric is telling you is where the rubber meets the road. In essence, how to manipulate your traffic for this one metric, it’s really the whole game. It’s so much simpler than what many entrepreneurs and marketers have been led to believe. Remember, we’ve got method, we’ve got metrics. Underneath method is all the different types of traffic generation approaches that you can use, all the different platforms, all that stuff, which we’re going to put aside for right now, underneath metrics that’s where we are right now. I want you to understand the ins-and-outs of “CPA”. I want to talk to you about Cost Per Acquisition. Because deciding on that, choosing that target or maximum CPA is a critical thing for you. It will either break your business… or build your empire. I’m serious. It’s a critical thing for you because without knowing what it is that you can afford to invest to get a customer, it becomes very difficult to make any sort of media buying decisions. It’s kind of like going out shopping without really knowing what it is that you can afford to spend on your new home. How can you make any sort of decisions whether a neighborhood is too expensive for you or whether you can afford to go up to a nicer, more expensive community? Unless you know what it is that you can afford to spend, you have no way of making a really scientific decisions about are you in the right neighborhood, are you looking at the right houses, can you make this work, can you not make this work, is this going to put you in debt, are you going to burn through all of your money trying to afford this house, or can you afford something bigger, better, nicer, etc? It ALL begins by determining what it is that you can afford to invest to get a customer. 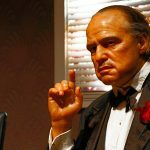 Now, if you’ve been around me, my world, if you’ve gone to MFA live, if you’ve gone through the E-5 camp master class, or really any of my other trainings, you’ve heard me talk about the three different levels of acquisition aggression. I’ll break this down for you in a future post, but what I want you to understand is that there are three different approaches that you can take when determining what it is that you can afford to spend or invest to acquire a customer. What is right for one business, may not be right for you. What is most appropriate for your business, which you’ll understand in a second, might not be appropriate for another business. You might be able to spend more than another business, but you might be able to spend less than a competitor’s business at this point. Remember, this is about deciding what can afford to invest. What can afford to spend to bring a single new customer into your business. As a side note, you’ll notice that I use the word invest rather than spend. 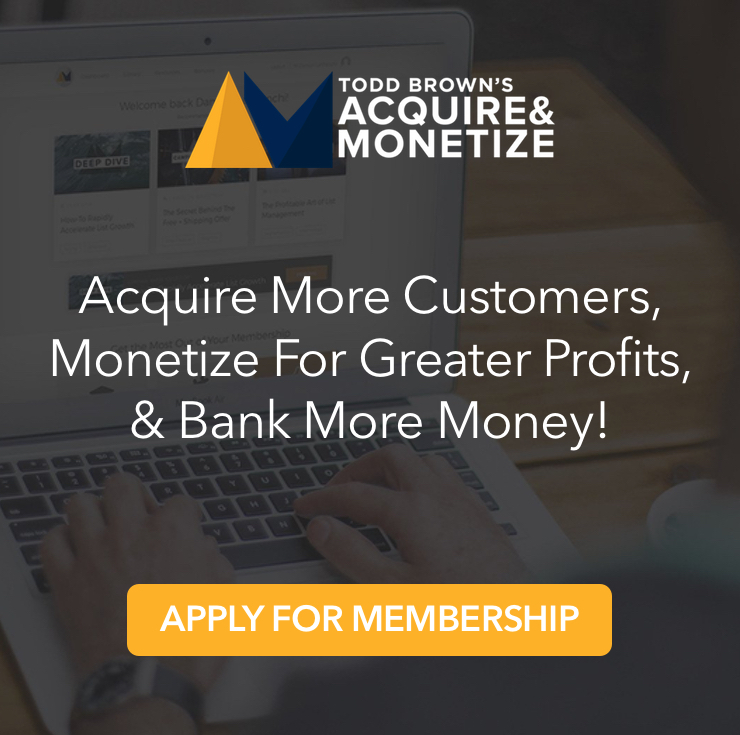 What is it that you can afford to invest, to acquire, a single new customer, not spend, because customer acquisition done correctly is an investment. It’s NOT an expense like your electric bill, or your phone bill, it’s an investment. It’s an investment because there is a future value, a future payoff, a future worth to every customer. If you take care of them, if you deliver the goods, if you exceed their expectations, your customers should become worth more to you over time as you deliver more value, as you are exceed their expectations more, as you nurture that relationship. Your customer should become worth more to you over time. Because they should invest more money with you and your business, they should participate in more transactions, they should want more things from you. By participating in more transactions, over time, they become worth more money to you and your business. They spend more money with you and your business. It’s about thinking like an investor. You are investing in the acquisition of assets, assets that have a value today, and assets that have a future value, in a week from now, a month from now, two months from now, six months from now, a year from now, etc. Traffic generation is about investing in the acquisition of business assets. The assets in question? Customers. The value of those assets today is the average amount of money that the typical or average new customer spends with you on their first transaction. What is the average amount of money that a new customer spends with you during their first transaction? Some of your customers might spend $100, some might spend $10, some might spend $50, some might spend $400, but there’s always an average. When it comes to your metrics and it comes to making decisions about buying media and scaling, it’s all about averages. Don’t worry if some people spend five times and some people spend a quarter of what … We’re dealing with averages. For example: if the average new customer spends 50 bucks with you, during their first transaction, that means the asset that you are acquiring today, the new customer, on average is worth $50 to you today. That assets value today is your average transaction value, in this example, $50. But like I said earlier, you know that through nurturing and caring for your customers, that your customers are going to spend more money with you over time. We know that $50 of value today is only going to go UP over the coming weeks and months and ideally, years. The future value is what we call in the world of direct marketing, direct response, “lifetime customer value”. Lifetime customer value (LCV) is just what’s the average amount of money that the typical customer spends with you over the life of their patronage with you and your business. 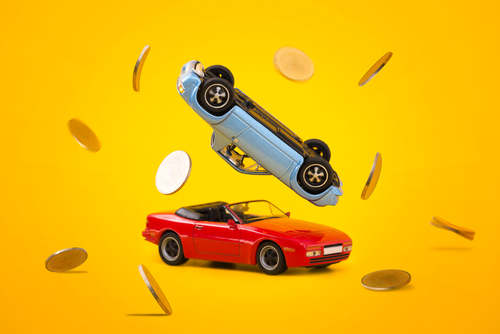 Some customers might spend $5,000 some might spend $100 some might spend $2,000, some might spend $175, but what is the average amount? If you take your total amount of sales that you generated since being in business, for example, and you divide that by the total number of customers that you transacted with, you’re going to get a value for each customer. You’re going to see that some customers could be worth, like I said, multiple, some customers could be worth a fraction, but you’re going to get an average lifetime value as of today. It’s snapshot into your business of what their lifetime value is. That’s future value, AKA lifetime customer value. Let’s say, to continue with our example, that the average lifetime customer value in your business is $500. 10 times what they spend with you during that first transaction. Now you’re acquiring an asset in this example, that has a value today of $50 and a future value of $500. Now, do you see how you have to think like an investor? You think like an investor, when you look at the metrics this way. Would you be willing to spend $20 today to get an asset that’s worth $50 today and then is worth a total of 500 in the future? Only a knucklehead wouldn’t invest $20 today to get an asset that’s worth $50 today and $500 in the future. Ironically that’s how the typical mom-and-pop entrepreneur operate. That’s actually the first level of acquisition aggression… But we’ll talk about that in a future post. 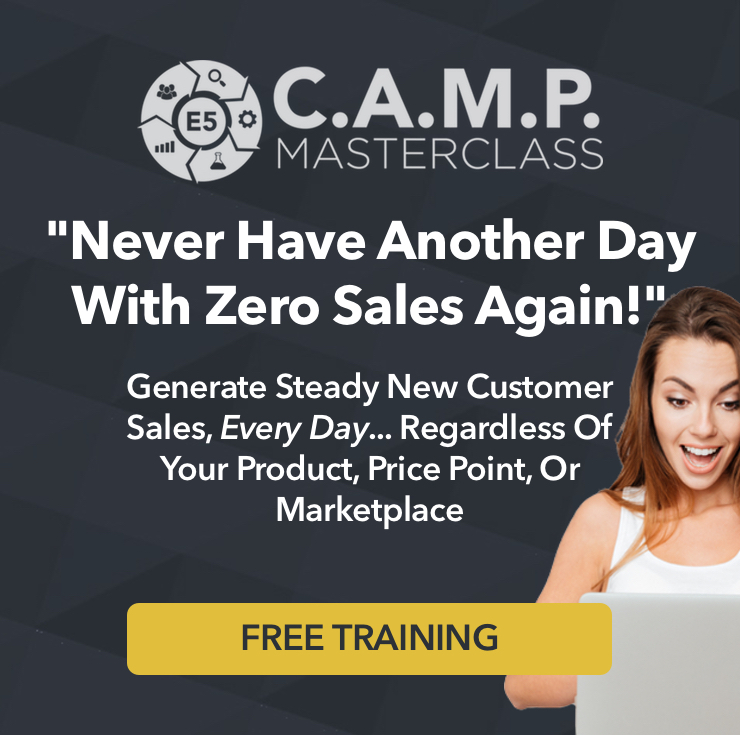 If you want more training on how to properly invest in customer acquisition to build a thriving business, I highly recommend you go through the E5 Camp Master Class. Today we talked about big picture overview of traffic and media buying, we talked about there’s method and there’s metrics, and then with metrics there’s target and there’s measurement and specifically, we talked about thinking like an investor and understanding your maximum allowable CPA, your maximum allowable cost per acquisition. We go much deeper in the E5 Camp Master Class. 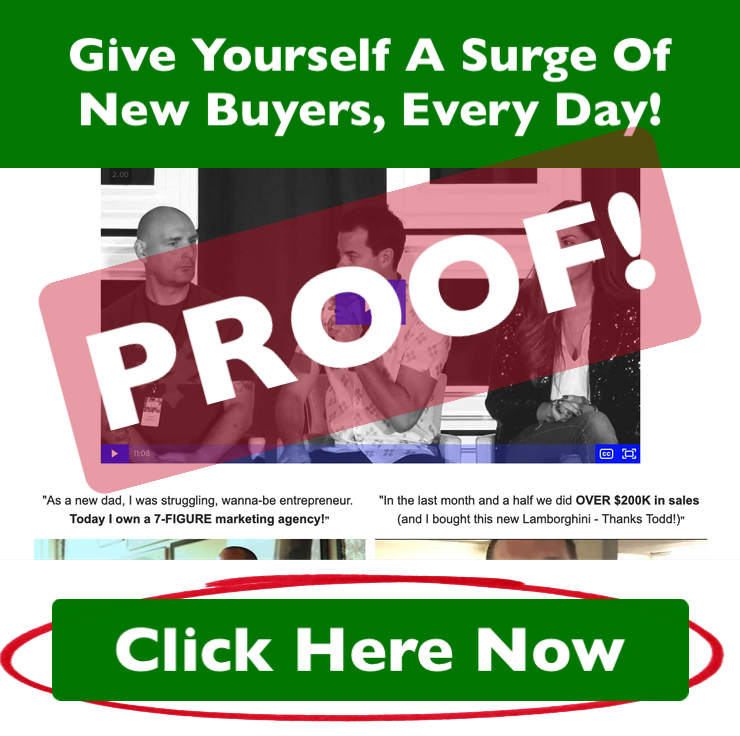 It gives you step-by-step training for how the big boys (billion dollar direct response companies) build their empires using paid media. Good news is that it’s not rocket science, it’s not creativity… it’s simple math. Remember, when it comes to customer acquisition, always think like an investor.